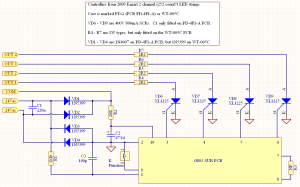 This circuit is typical of a lot of older LED string sets. The output is half wave so there is some flicker, but being at 100Hz it’s not really noticeable. These LED icicle tubes were one of the first ones out in retail stores. They leaked like a sieve but the effect was still pretty good for the price. I still use them on my pop-up Christmas trees as they’re under cover. Someone asked me about hooking up a transformer with 2 x 12V windings to power some 24V lights. This is how the secondary series output connections are made. Always put a fuse inline with the primary (input) winding. On one of the Christmas forums, someone was wanting to control a motor from an Arduino or similar. 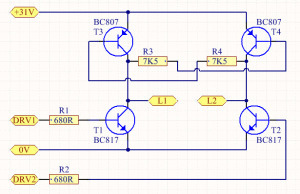 Applying 5V to the forward or reverse inputs will activate the associated relay. If both inputs are activated, the motor will not run and no damage will occur. I drew up this circuit when someone asked me about automatically reducing the audio volume in their Christmas display when there were no visitors present. It wires between the music source and the amplifier and switches from a lower preset level to full when the relay is activated by a PIR or other “people sensor”. You will need a double pole relay, dual gang pot and a second resistor for stereo operation. This is the output drive stage for the new style 2-wire LED string sets. I’ve gone into more detail on a separate page. 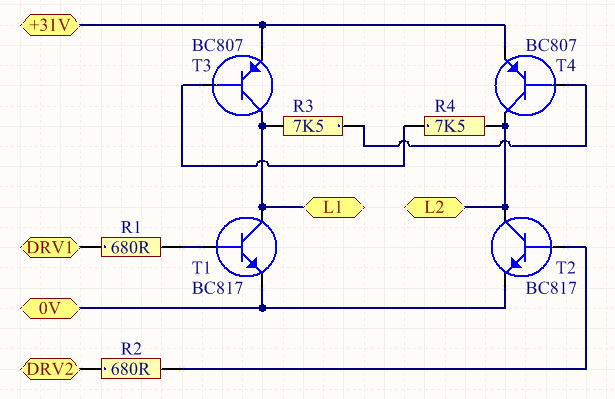 This is the circuit of the cheap arse power supply from a set of meteor tube lights. There is no isolation between the mains and low voltage side. 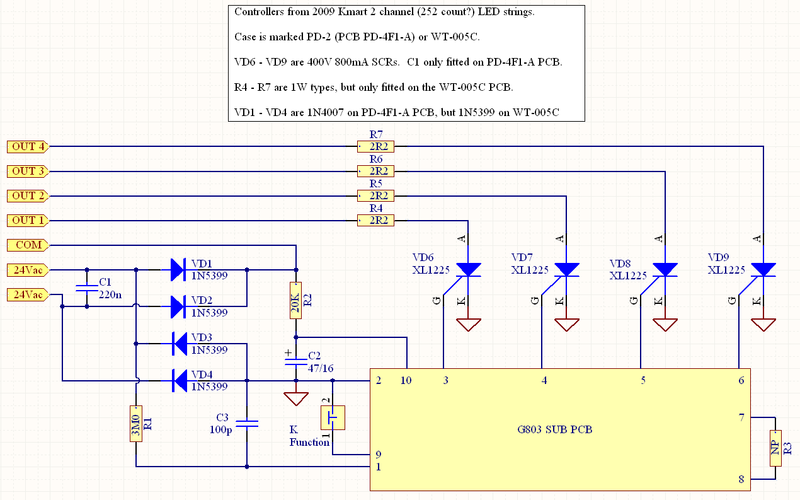 I’ve detailed the circuit here for technical interest. Please don’t actually use it! There’s a separate page on the light set that this power supply came with. This 20 LED light set runs directly from 240V AC. The diodes rectify the mains and provide approx 340V DC across the capacitor. 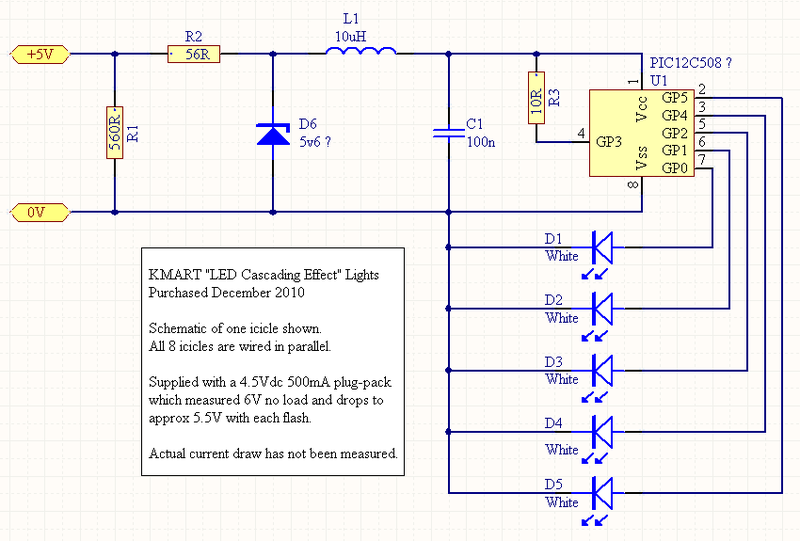 Each LED drops approx 2V (40V for 20 LEDs), so that leaves 300V to be dropped across the resistors. Using Ohms law (I = V / R) , we can calculate that approx 8mA flows through the LEDs. Be aware that the LEDs and all the wiring is at mains potential so exercise extreme caution. 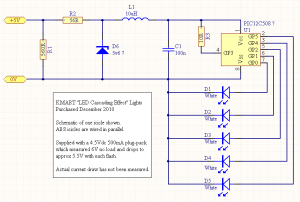 I’ve done a quick writeup on the light set that this circuit is for.